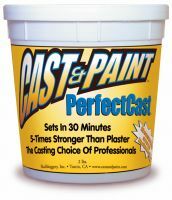 The professional�s choice for casting medium, PerfectCast is five times stronger than any other regular plaster. AP-certified nontoxic and easy to use, it reproduces every tiny detail from the original mold, every time - which is why it's named PerfectCast. Everything you need is in the jar - just add water. Use it with all your Cast & Paint kits, or any casting molds.